With iCloud syncing, your version of iOS and the apps on your iPhone should always be current. If you’re having problems, however, tap Settings→General→Software Update just to be sure your iOS is current. If a badge appears on the App Store icon, chances are the Automatic Downloads option isn’t on for Apps. Go to Settings→iTunes & App Store and tap Apps to the On position under Automatic Downloads. Make sure the SIM card is properly installed (if your iPhone uses one). If you dropped your iPhone, the SIM card may be slightly dislodged. Carefully insert the end of a paper clip in the hole of the SIM tray to open the tray. Take out the SIM card and re-insert it and then gently push the tray closed. The headset is plugged in but you can’t hear anything. Make sure the headset is plugged in all the way — it makes a little “click” when it is. It may not be compatible with the cover or bumper (those colored frames that go around iPhone’s outer edge) you use; that is, the cover keeps the plug from going all the way into the hole. Although 1/8-inch plugs work most of the time, the specifications call for a 3.5 mm plug. Make sure the jack is clean. If you use your iPhone in a dusty workshop or in the yard, or eat toast while texting, crumbs and particles can build up and block the audio jack. Ever-so-gently tap your iPhone on a not-too-hard surface (a placemat on a table, for example, or a mousepad) or use a hand pump with the nozzle for inflating a basketball to blow into the jack. The wordsNo Serviceappear where your carrier’s name usually appears. First, make sure you aren’t in Airplane Mode. Try moving closer to a window or going outside. Then, try turning 3G/4G on or off. Try turning Airplane Mode On and then Off. Try turning your iPhone off and on again. Lastly, go to Settings→General→Reset and tap Reset Network Settings. If you have a weak signal, turning 3G/4G on can bring a stronger signal. If you’re in a crowded area with lots of other cell phone users, turning 3G/4G on gives you access to a larger network. You don’t have Internet access. Disconnect and reconnect to the network. Drag up from the bottom of the screen to open the Control Center. Tap Wi-Fi Off, wait a minute, and then tap Wi-Fi On. Try forgetting the network and joining again. Tap Settings→Wi-Fi, and then tap the name of the network. Tap Forget This Network and then sign in again. Try renewing the Dynamic Host Control Protocol (DHCP) lease, which is the access point that allows your iPhone to access a Wi-Fi network. Tap Settings→Wi-Fi. 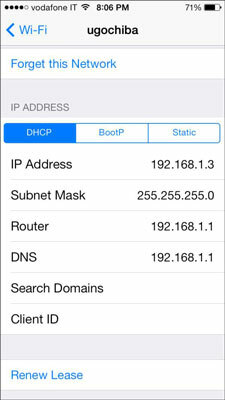 Tap the Info (i) button to the right of the connected Wi-Fi network, and then tap the DHCP tab. Scroll down the screen and tap the Renew Lease link. Reset network settings by tapping Settings→General, and then scroll down to Reset, which is the last button on the screen. Tap Reset Network Settings. Look for interference from devices like walkie-talkies or baby monitors. If you know Wi-Fi should be available because, say, you’re home, and none of these procedures work, the problem could be with the Wi-Fi router, modem, or incoming DSL line. Try turning your router off and on again or call your service provider. You can’t send text messages. For SMS and MMS messages, make sure you have cellular service. iMessage requires a Wi-Fi or cellular data connection, and iMessage has to be turned on via Settings→Messages→iMessage→On. Check that the recipient’s phone number has an area code and that you typed your message in the message field and not the subject line. You can send SMS but iMessage doesn’t work. Go to Settings→General→Reset and tap Reset Network Settings. You can’t receive or send e-mail or you see messages but you can’t open them. Make sure you have an Internet connection, either through your cellular data network or Wi-Fi. Try re-entering your password. Tap Settings→Mail, Contacts, Calendars→Account Name→Account. Delete and retype the password..
Syncing doesn’t seem to work. If you use iCloud, make sure you are signed in to the correct account: Tap Settings→iCloud→Account and enter the Apple ID and password you use with iCloud — remember it must be in the form of an e-mail address. If you use iTunes, make sure the USB connector cable is properly inserted in both your computer and your iPhone. If you sync wirelessly with iTunes, make sure your iPhone and computer are on the same wireless network. If you are using Mac OS X 10.9 Mavericks, iTunes syncing is different than syncing with earlier versions of OS X or with Windows. The battery drains faster than usual, especially after an iOS update. Double-click the Home button to see the apps in the open apps carousel. Swipe up on each one, or two or three at a time, until you’ve closed all of them. Tap General→Reset and then choose Reset All Settings. This “clears out” some of the cobwebs in your iPhone’s memory and may fix battery charge problems.